Medium: silkscreen / serigraph (after the painting). This silkscreen was printed by Domberger for the cover of the rare Formen der Farbe portfolio, published in 1967 by Kunstverein Stuttgart of West Germany. 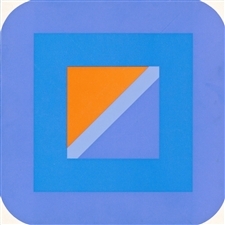 Several important artists contributed compositions to this project, including Al Held, Kenneth Noland, Ellsworth Kelly, Robert Indiana, William Turnbull, Georg Karl Pfahler and Victor Vasarely. Sheet size: 10 1/2 x 10 1/2 inches (270 x 270mm). Signed in pencil by the artist on the back side (see the second photo). Condition: there is some wear, scuffs and scratches to the surface. Medium: silkscreen / serigraph (after the painting). This silkscreen was printed by Domberger for the cover of the rare Formen der Farbe portfolio, published in 1967 by Kunstverein Stuttgart of West Germany. Several important artists contributed compositions to this project, including Al Held, Kenneth Noland, Ellsworth Kelly, Robert Indiana, William Turnbull, Georg Karl Pfahler and Victor Vasarely. Sheet size: 10 1/2 x 10 1/2 inches (270 x 270mm). Not signed.